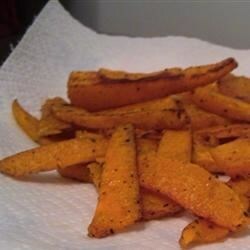 "These butternut squash fries are nutritious and tasty! They taste like sweet potato fries but better." Use a sharp knife to carefully cut away the peel from the squash. Cut the squash into sticks like French fries. Arrange squash pieces on a baking sheet and season with salt. Bake for 20 minutes in the preheated oven, turning the fries over halfway through baking. Fries are done when they are starting to brown on the edges and become crispy. See how to make spicy, salty, slightly sweet baked squash fries. I treated like we do zuchini or eggplant. salt them and put them on a papertowel and let the salt pull water from them...then oil, season and bake. HUGE difference and more like fries. I could cry these are so good. My first experience with butternut squash and im hooked. I had no idea it would be so sweet and rich tasting. Thanks for the non-intimidating recipe! Toss the squash in a little olive oil first, they will be a lot tastier and not stick to the pan. I used butter spray first then seasoned with Mrs. Dash as I cook salt free. Yum. Even the kids liked them.